Snow Owl's development framework can build appropriate user interfaces based on the concept model. For example, it is simple to create a generic editor that can display appropriate choices of description types, relationships, and concrete datatypes based on the concept being edited. We have used this feature to create a constraint-driven reference set editor. A new reference set editor allows editing concepts based on their MRCM constraints. When editing a concept, the rules for description types, attributes, and concrete datatypes for the concept are determined based on the MRCM and a suitable user interface is provided. 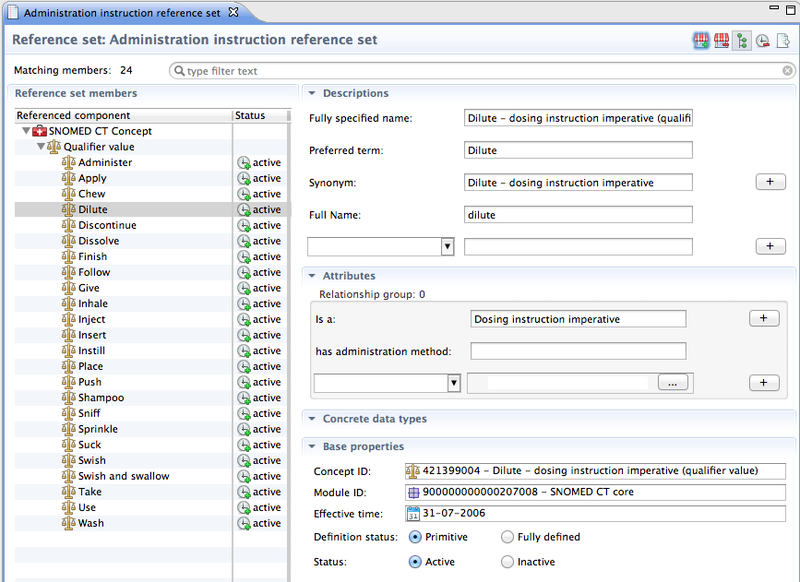 The descriptions section is built based on the sanctioned MRCM constraints. Required description types will always appear, even if their descriptions are not set. A combo box at the bottom of the section allows adding unsanctioned description types. The attributes section displays the sanctioned relationship types for the current concept. The possible values for each relationship type are also constrained based on MRCM rules. A blank combo box at the bottom of this section allows adding unsanctioned relationship types. The concrete domain section displays the sanctioned concrete domains for the current concept. An appropriate widget will be built based on the datatype: a checkbox for Boolean; a calendar widget for DateTime; and fields to enter String, and numerical data types. This section provides basic information about the concept, including the concept ID and module, its effective time, whether it is fully-defined, and its status.